Hei Leung has always been passionate about diversity, especially genetic diversity, and that’s one reason why he leapt at the chance to get involved with the CGIAR Generation Challenge Programme (GCP) right from its inception more than a decade ago. But GCP’s attraction for Hei wasn’t just about genetic diversity; it was also about working with diverse institutes and researchers. At the time, Hei had been working for the International Rice Research Institute (IRRI) for some 10 years, on and off, including a stint at Washington State University in the USA. “The whole idea of the Challenge Programme was to bring people together from different places instead of an individual CGIAR Centre doing things,” he says. Hei also saw the likely spin-offs from rice research to other crops such as wheat, maize and sorghum, which are also crucial to food security. From little pizzas great programmes grow! It all began in 2003, over pizza, in Rome. Hei remembers that his commitment to GCP started when he met with a small group of people including Robert Zeigler, who was to become the first Director of GCP, and who is currently Director General of IRRI. 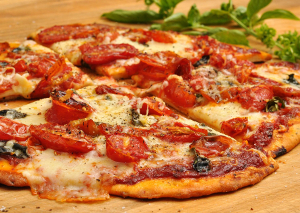 “Little did we know that pizza was so inspiring,” Hei says, recalling that it was during that meeting that they agreed on the name: the Generation Challenge Programme. GCP was formally launched in 2004 in Brisbane, Australia, at the 4th International Crop Science Congress. 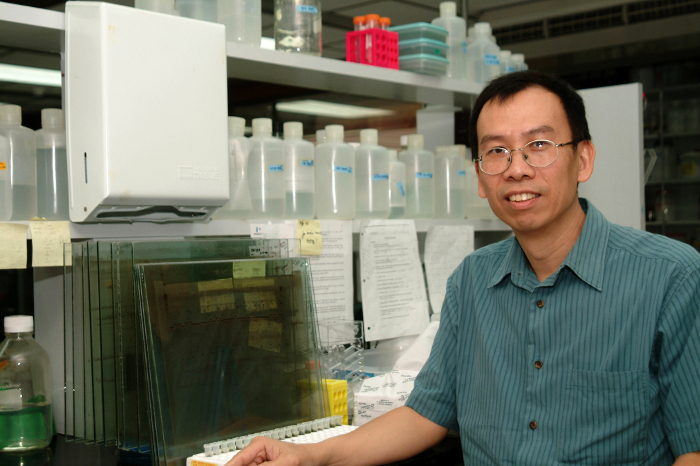 Hei was initially involved with GCP as Subprogramme Leader for Comparative Genomics for Gene Discovery between 2004 and 2007, and later as a Principal Investigator for the Rice Research Initiative. Taking on his leadership role, Hei recognised from the start that many crops important to developing communities in Asia and Africa needed to become more drought-tolerant because of the increasing effects of climate change. 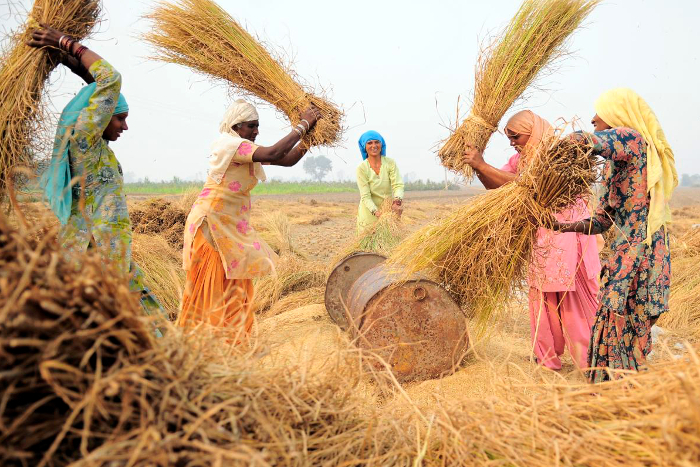 Women at work threshing rice near Sangrur, Punjab, India. Rice is the world’s most widely consumed cereal crop, and is particularly important as the staple food of 2.4 billion people in Asia. GCP recognised rice’s importance and invested almost USD 29.5 million in rice research and development. Furthermore, the genetic breeding lessons learnt from rice can also be applied to other staple crops such as wheat, maize and sorghum. Other GCP-supported researchers used comparative genetics to determine if the same or similar genes – for example, the phosphorus starvation tolerance (PSTOL1) protein kinase gene found in rice – was also present and operating in the same manner in sorghum and maize. They found sorghum and maize varieties that contained genes, similar to rice’s PSTOL1, that also conferred tolerance to phosphorus-deficient soils by enhancing the plant’s root system. They were then able to develop molecular markers to help breeders in Brazil and Africa to identify lines with these genes, which can now be used in breeding and developed as varieties for farmers growing crops, particularly in acidic soils. Hei also recognised that crops that received less scientific attention but remained important as regional staple foods, such as bananas and plantains (of the genus Musa), could benefit from comparative genomics research. “We had a highly motivated group of researchers willing to devote their efforts to Musa,” remembers Hei, who is currently IRRI Program Leader of Genetic Diversity and Gene Discovery. 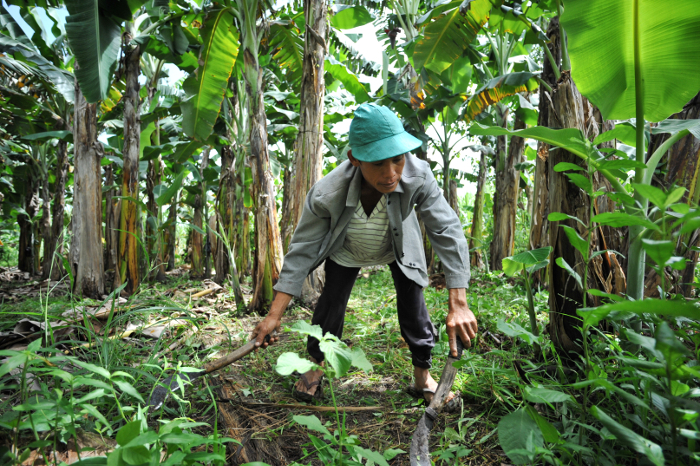 A banana farmer at work in the Philippines. While Hei stepped down from a leadership role, he remained active working on GCP projects throughout the life of the Programme. The development of MAGIC (multi-parent advanced generation intercross) populations is the project that Hei gets most excited about. From these populations, created by crossing different combinations of multiple parents, plant lines can be selected that have useful characteristics such as drought tolerance, salinity tolerance and the ability to produce better quality grain. Hei Leung looking relaxed in the lab at IRRI. Making a difference to food security and farmer’s lives in developing countries is what GCP is all about. Such differences have been made possible through collaborative links that connect a diversity of organisations and people with the latest research in genetic diversity and breeding techniques. 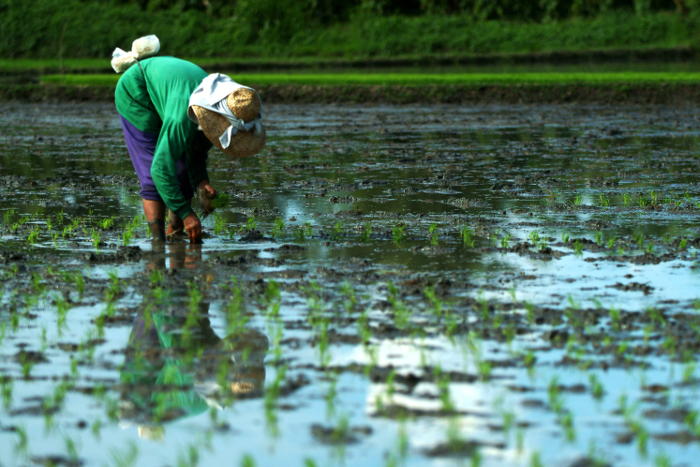 A farmer transplants rice in the Philippines. 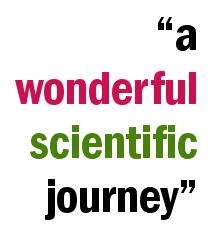 Hei recalls his personal and professional journey with GCP with much affection: “I think that it has been a wonderful scientific journey in terms of knowing the science and opening up my mind to being more receptive to alternative ways of doing things. “There have been so many friends I have met through networking with GCP. Sometimes you go through bumpy roads, but anything you do will have bumpy times. And it’s very unusual to have a programme so illuminating. We honoured our commitment to finish in 10 years. It is a programme that had a fresh start and a clean ending. A woman harvests rice in Ifugao, The Philippines. Plant geneticist Sigrid Heuer remembers very clearly entering the transgenic greenhouse in Manila to see her postdoctoral student holding up a rice plant with ‘monster’ roots. “They were enormous,” she recalls. “This is when I knew we had the right gene. It confirmed years of work. That was our eureka moment. This genetic discovery – described in more detail a little later – is one of the shining lights of the 10-year-long CGIAR Generation Challenge Programme (GCP) established in 2004. GCP-supported researchers aimed high: they wanted to contribute to food security in the developing world by using the latest advances in crop science and plant breeding. And with the lives of half of the world’s population directly reliant on their own agriculture, there is a lot at stake. Land degradation, salinity, pollution and excessive fertiliser use are just some of the challenges. Amelia Henry, drought physiology group leader at the International Rice Research Institute (IRRI), explains why rice was such a critical crop for GCP research. She says rice is grown in a diverse set of environmental settings, often characterised by severe flooding, poor soils and disease. Cycling through rice fields in Odisha, India. In Asia, 40 percent of rice is produced in rainfed systems with little or no water control or protection from floods and droughts – meaning rice plants are usually faced with too much or too little water, and rarely get just enough. In addition, 60 percent (29 million hectares) of the rainfed lowland rice is produced on poor and problem soils, including those that are naturally low in phosphorus. Phosphorus deficiency and aluminium toxicity are two of the most widespread environmental causes of poor crop productivity in acidic soils, where high acid levels upset the balance of available nutrients. And drought makes these problems even worse. Phosphorus is essential for growing crops. Its commercial use in fertilisers is due to the need to replace the phosphorus that plants have extracted from the soil as they grow. Soils lacking phosphorus are an especially big problem in Africa, and the continent is a major user of phosphate fertilisers. However, inappropriate use of fertilisers can, ironically, acidify soil further, since excess nitrogen fertiliser decreases soil pH. Meanwhile, high levels of aluminium in soil cause damage to roots and impair crop growth, reducing their uptake both of nutrients like phosphorus and of water – making plants more vulnerable to drought. Aluminium toxicity is a major limitation on crop production for more than 30 percent of farmland in Southeast Asia and South America and approximately 20 percent in East Asia, sub-Saharan Africa and North America. The challenge today is to tap into the genetic codes of key crops such as rice and wheat to feed a growing global population. Science plays a crucial role in identifying genes for traits that help plants tolerate more difficult environmental conditions, and producing crop varieties that contain these genes. Plant biologists are already developing new rice lines that produce higher yields in the face of reduced water, increasingly scant fertiliser as costs rise, and unproductive soils. However, ‘super’ crops are needed that can combine these qualities and withstand climate changes such as increasing temperatures and reduced rainfall in a century when the world’s population is estimated to reach nearly 10 billion people by 2050. Ambitious in concept, the GCP research focussed on bringing together experts to work on these critical problems of rice production for some of the world’s poorest farmers. The programme was rolled out in two phases that sought to explore the genetic diversity of key crops and use the most important genes for valuable traits, such as Sigrid’s discovery made in a rice variety that is tolerant of phosphorus-poor soils. Each phase involved dedicated teams in partner countries. 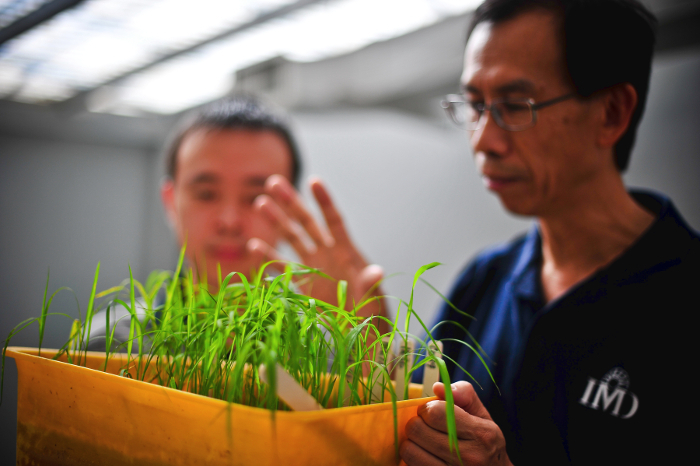 GCP Principal Investigator Hei Leung, from IRRI, says GCP is unique, one of kind: “I love it.” He says GCP has enabled rice researchers and breeders to embrace cutting-edge science through partnerships focussed on improving crop yields in areas previously deemed unproductive. Hei says GCP wanted to target research during its second phase on those crops that most poor people depend upon. “We wanted to have a programme that is what we call ‘pro-poor’, meaning the majority of the world’s people depends on those crops,” he says. Rice is the ‘chosen one’ of GCP’s cereal crop research and development, with the biggest slice of GCP’s research activities dedicated to this, the most widely consumed staple food. It is crucial to increase rice supplies by applying research and development such as that carried out by GCP researchers over the past 10 years, Hei says. 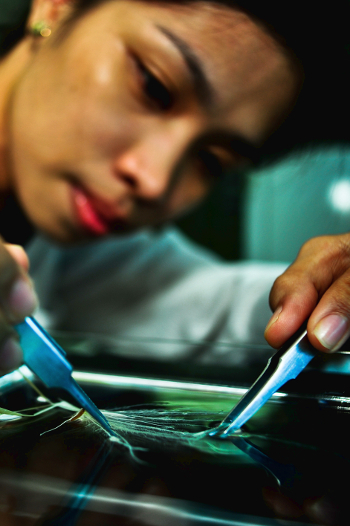 For more on the relationship between GCP and IRRI – and an extra sprinkling of salt on your rice (fields) – see our Sunset Story ‘Rice research reaps a rich harvest of products, people and partners’. Researchers had been trying to map the genomes of key cereal crops for over two decades. 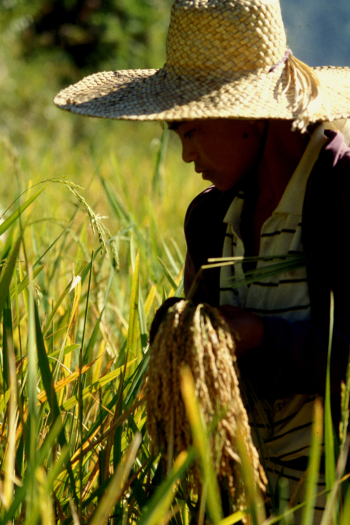 Rice’s genome was mapped in 2004, just as GCP started. Rice has a relatively small genome, one-sixth the size of the maize genome and 40 times smaller than the wheat genome. This makes it a useful ‘model’ crop for researchers to compare with other crops. “People like to compare with rice because wheat and maize have very big genomes, and they don’t have the resources,” explains Hei. After the rice genome had been sequenced, the next step was to focus down to a more detailed level: the individual genes that give rice plants traits such as drought tolerance. Identifying useful genes, and markers that act as genetic ‘tags’ to point them out, gives scientists an efficient way to choose which plants to use in breeding. One of GCP’s Principal Investigators for rice was Marie-Noëlle Ndjiondjop, a senior molecular scientist with the Africa Rice Center. Meet Marie-Noëlle below (or on YouTube), in our series of Q&A videos on rice research in Africa. Marie-Noëlle’s team recognised that drought tolerance was likely to be a complex trait in rice, involving many genes, due to the mix of physiological, genetic and environmental components that affect how well a plant can tolerate drought conditions. To help discover the rice varieties likely to have improved drought tolerance, Marie-Noëlle’s team used an innovative approach known as bi-parental marker-assisted recurrent selection (MARS). “With such a complex trait, you really need to have all the tools and infrastructure necessary; through GCP we were able to buy the necessary equipment and put in the infrastructure needed to find and test the drought trait in rice lines. Likewise, Amelia Henry’s IRRI team also developed drought-tolerant lines, particularly for drought-prone areas of South Asia. She says many of the promising deep-rooted or generally drought-tolerant varieties identified in the early decades after IRRI’s foundation in 1960 are still used today as ‘drought donors’. 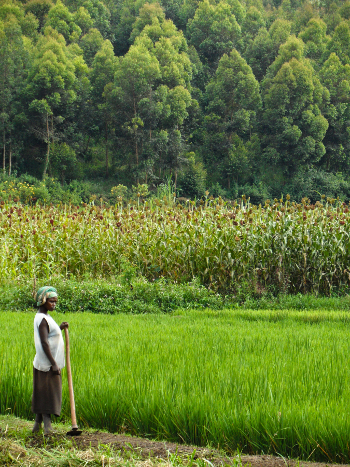 A rice farmer in Rwanda. But the researchers could not rest with just one of rice’s problems solved. Sigrid Heuer was in The Philippines working for IRRI when she became involved in the ground-breaking phosphorus-uptake project for rice. She took over the project being headed by Matthias Wissuwa. Much earlier, Matthias had noted that Kasalath – a traditional northern Indian rice variety that grew successfully in low-phosphorus soil – must contain advantageous genes. His postdoctoral supervisor, Noriharu Ae, thought that longer roots were likely to be the secret to some rice varieties being able to tolerate phosphorus-deficient soils. Screening for phosphorus-efficient rice, able to make the best of low levels of available phosphorus, on an IRRI experimental plot in The Philippines. Some types of rice have visibly done much better than others. Sigrid Heuer used her background in molecular breeding to take up the challenge with GCP to find the genes responsible for the Kasalath variety’s long roots. “I spent years looking for the gene,” Sigrid says. “It was like trying to find a needle in a haystack; the genomic region where the gene is located is very complex. Sigrid Heuer in the field at IRRI. Sigrid says that moment in the Manila labs was the turning point for the project’s researchers. Matthias’ team had previously identified a genomic region, or locus, named Pup1 (‘phosphorus uptake 1’) that was linked to phosphorus uptake in lines of traditional rice growing in poor soils. However, its functional mechanism remained elusive until the breakthrough GCP-funded project sequenced the locus, showing the presence of a Pup1-specific protein kinase gene, which was named PSTOL1 (‘phosphorus starvation tolerance 1’). The discovery was reported in the prestigious scientific journal Nature on 23 August 2012 and picked up by media around the world. The gene instructs the plant to grow larger and longer roots, increasing its surface area – which Sigrid compares to having a bigger sponge to absorb more water and nutrients in the soil. “Plants growing longer roots have more uptake of phosphorus – and PSTOL1 is responsible for this. For some insight straight from the source, listen to Matthias in our podcosts below. In these two bitesized chunks of wisdom he discusses the importance of phosphorus deficiency and of incorporating PSTOL1 into national breeding programmes; his work in Africa and the possibility of uncovering an African ‘Pup2’; what the PSTOL1 discovery has meant for him; and the essential contribution of international partnerships and GCP’s support. Members of the IRRI PSTOL1, phosphorus uptake research team chat in the field in 2012. From left to right they are are: Sigrid Heuer, Cheryl Dalid, Rico Gamuyao, Matthias Wissuwa and Joong Hyoun Chin. Phosphorus-uptake gene not all it seemed – an imposter? But PSTOL1 was definitely not what it seemed. “It was identified under phosphorus-deficient conditions and the original screen was set up for that,” says Sigrid. Researchers eventually discovered that Pup1 and the PSTOL1 gene within it were not really all about phosphorus at all: “It turns out it is actually a root-growth gene, which just happens to enhance uptake of phosphorus and other nutrients such as nitrogen and potassium. Her team showed that overexpression of PSTOL1 gene significantly improves grain yield in varieties growing in phosphorus-deficient soil – by up to 60 percent compared to rice varieties that did not have the gene. In field tests in Indonesia and The Philippines, rice with the PSTOL1 gene produced about 20 percent more grain than rice without the gene. This is important in countries where rice is grown in poor soils. A farmer harvests rice in South Sulawesi, Indonesia. Sigrid, now based in Adelaide at the Australian Centre for Plant Functional Genomics, says the introduction of the new gene into locally adapted rice varieties in different locations across Asia and Africa is expected to boost productivity under low-phosphorus conditions. “The ultimate measure for these kinds of projects is whether a gene works in different environments. I think we have a lot of evidence that says it does,” she says. The discovery of PSTOL1 promises to improve the food security of rice farmers on phosphorus-deficient land though assisting them to grow more rice and earn more. Drought, low-phosphorus soils, aluminium toxicity, diseases, acid soils, climate change… the list seems never-ending for challenges to growing rice. Apart from the successes with drought and phosphorus that GCP scientists achieved, there was to be much more in the works from other GCP researchers. During GCP Phase I, a team led by Leon Kochian of Cornell University, USA, with colleagues at the Brazilian Corporation of Agricultural Research (EMBRAPA), JIRCAS and Moi University, Kenya, successfully identified and cloned a major sorghum aluminium-tolerance gene. In Phase II, they worked towards breeding aluminium-tolerant sorghum lines for sub-Saharan Africa, as well as applying what they learnt to discover similar genes in rice and maize. 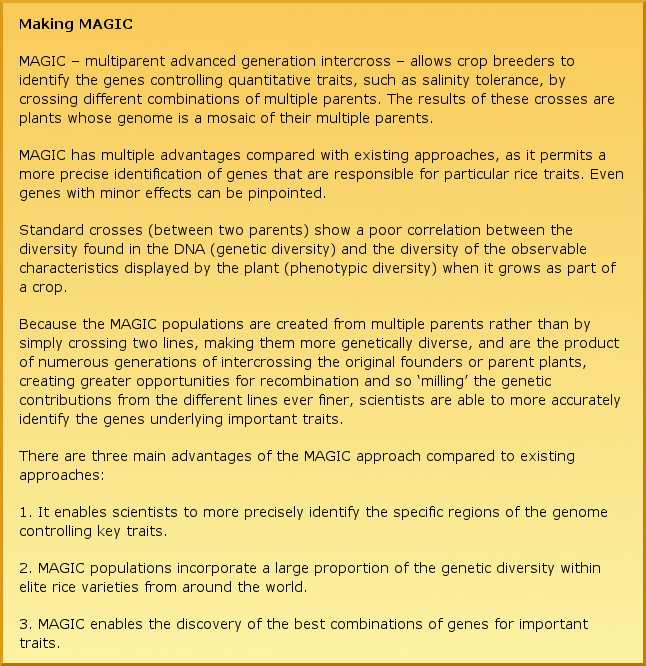 Hei Leung says GCP leaves a lasting legacy in the development of multiparent advanced generation intercross (MAGIC) populations. These help breeders to identify valuable genes, and from among the populations they can also select lines to use in breeding that have favourable traits, such as being tolerant to environmental stresses, having an ability to grow well in poor soils or being able to produce better quality grain. GCP funded the development of four different MAGIC populations for rice, including both indica and japonica types. And the idea of developing MAGIC populations has spread to other crops, including chickpeas, cowpeas and sorghum. For more on MAGIC see our Sunset Story ‘Rice research reaps a rich harvest of products, people and partners’. A farmer harvests rice in Nepal. Project Delivery Coordinators monitor projects first-hand, conducting on-site visits, advising project leaders and partners and helping them implement delivery plans. “One of the problems was the overall level of basic education of people who were involved in the project,” Nourollah says. Rice cultivation in Mali is on the rise. His work with GCP has opened up new prospects for some of the poorest farmers in the world: “For five years, I have been coordinating one of the rice initiatives implemented by the Africa Rice Center and involving three African countries.” These are Burkina Faso, Mali and Nigeria. He says GCP has brought much-needed expertise and technical skills to countries which can now use genetic insights to produce improved crops tolerant of drought conditions and poor soils and resistant to diseases. Using new molecular-breeding techniques has provided a more effective way to move forward, still firmly focussed on helping the world’s poorest farmers achieve food security. “We don’t change direction, we change tools – sometimes you have a bicycle, sometimes you have a car,” Nourollah says. Hei agrees there have been challenges: “It’s been a bumpy road to get to this point. But the whole concept of getting all the national partners doing genetic resource characterisation is a very good one. GCP has managed to meet both challenges. New crop varieties have been released to farmers, and more than 450 scientifically reviewed papers have been published since 2004. 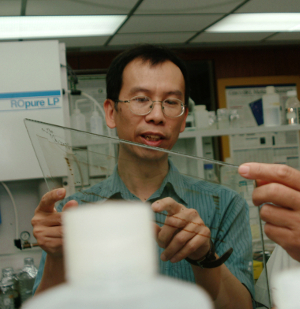 The work that GCP-supported researchers have done for rice is also being used in other crops. For example, researchers used comparative genomics to determine if genes the same as or similar to those found in rice are present and operating in the same manner in sorghum and maize. The GCP team found sorghum and maize varieties that contained genes, similar to rice’s PSTOL1, that also confer tolerance of phosphorus-deficient soil with an enhanced root system. They were then able to develop markers to help breeders in Brazil and Africa identify phosphorus-efficient lines. The knowledge that GCP-supported rice researchers have generated is shared through communities of practice, through websites, publications, research meetings and the Integrated Breeding Platform. As Amelia Henry notes, GCP’s achievements will be defined by “the spirit of dedication to openness with research data, results and germplasm and giving credit and support to partners in developing countries.” The work in rice in many ways exemplifies GCP’s collaborative approach, commitment to capacity building and deeply held belief that together we can go so much further in helping farmers. Unlocking genetic diversity in crops for the resource-poor was at the heart of GCP’s mission, which in 2003 promised ‘a new, unique public platform for accessing and developing new genetic resources using new molecular technologies and traditional means’. Certainly for poor rice farmers in Asia and Africa, the work that GCP has supported in applying the latest molecular-breeding techniques will lead to rice varieties that will help them produce better crops on poor soils in a changing climate. It’s a cruel feature of some of the most populous areas of the world, particularly in the tropics and subtropics: acid soils. They cover a third of the world’s total land area – including significant swathes of Africa, Asia and Latin America – and 60 percent of land we could use for growing food. Today around 30 percent of all arable land reaches levels of acidity that are toxic to crops. Soil acidity occurs naturally in higher rainfall areas and varies according to the landscape and soil. But we also make the problem worse through intensive agricultural practices. The main cause of soil acidification is the overuse of nitrogen fertilisers, which farmers apply to crops to increase production. Ironically, the inefficient use of nitrogen fertiliser can instead make matters worse by decreasing the soil pH. 60 percent of the world’s potential crop-growing land is highly acidic. Map courtesy of Leon Kochian. Acidity prevents crops from accessing the right balance of nutrients in the soil, limiting farmers’ yields. Its negative effect on world yield is second only to drought and is particularly hard felt by subsistent and smallholder farmers who cannot afford to correct soil pH using calcium-rich lime. As a result, these farmers are forced to grow less profitable, acid-tolerant crops like millet, or suffer huge yield losses when growing more popular cereal crops like wheat, rice or maize. As is true in many other sub-Saharan countries, maize is a staple of the Kenyan diet: the average Kenyan consumes 98 kilograms of it each year. But maize prices in Kenya are among the highest in Africa, which directly affects the poorest quarter of the population, who spend 28 percent of their income on the crop. “Yield losses play a big part in this economic imbalance and are why we need affordable agronomic options to help our farmers improve yields,” says Samuel, who was a Principal Investigator of a GCP comparative genomics project which sought to provide some of these options. A Kenyan farmer prepares her maize plot for planting. Acid soils cover almost 90 percent of Kenya’s maize-growing area, and can more than halve yields. Between 2004 and 2014, crop researchers and plant breeders across five continents collaborated on several GCP projects to develop local varieties of maize, rice and sorghum that can withstand phosphorus deficiency and aluminium toxicity – two of the most widespread constraints leading to poor crop productivity in acidic soils. Aluminium toxicity is the primary limitation on crop production for more than 30 percent of farmland in Southeast Asia and Latin America and approximately 20 percent in East Asia, sub-Saharan Africa and North America. Aluminium becomes more soluble in acid souls, creating a toxic glut of aluminium ions that damage roots and impair their growth and function. This results in reduced nutrient and water uptake, which in turn depresses yield. Phosphorus deficiency is the next biggest soil deficiency after nitrogen to limit plant production. In acid soils, phosphorus is stuck (fixed) in forms that plants cannot take up. All plants need phosphorus to survive and thrive; it is a key element in plant metabolism, root growth, maturity and yield. Plants deficient in phosphorus are often stunted. In a double whammy, the damage that aluminium toxicity causes to roots means that plants cannot efficiently access native soil phosphorus or even added phosphorus fertiliser – and adding phosphorus is an option that is rapidly becoming less viable. “The world is running out of phosphorus as quickly as it is running out of oil,” says Leon Kochian, a Professor in the Departments of Plant Biology and Crop and Soil Science at Cornell University in the USA. “This is making its application a more expensive and less sustainable option for all farmers wanting to improve yields on acidic soils.” Indeed, the price of rock phosphate has more than doubled since 2007. For 30 years, Leon has combined lecturing and supervising duties at Cornell University and the United States Department of Agriculture with his scientific quest to understand the genetic and physiological mechanisms that allow some cereals to tolerate acidic soils while others wither. And for the last 10 years, he has played an important leading role in GCP’s effort to develop new, higher yielding varieties of maize, rice and sorghum that tolerate acidic soils. The rationale behind GCP’s efforts stems from two independent and concurrent projects, which had been flourishing on different sides of the Pacific well before GCP was created. One of those projects was co-led by Leon at Cornell University in collaboration with a previous PhD student of his, Jurandir Magalhães, at the Brazilian Corporation of Agricultural Research (EMBRAPA) Maize & Sorghum research centre. Working on the understanding that the cells in grasses like barley and wheat use ‘membrane transporters’ to insulate themselves against excessive subsoil aluminium, Leon and Jurandir searched for a similar transporter in the cells of sorghum varieties that were known to tolerate aluminium. “In wheat, when aluminium levels are high, these membrane transporters prompt organic acid release from the tip of the root,” explains Jurandir. “The organic acid binds with the aluminium ion, preventing it from entering the root.” Jurandir’s team found that in certain sorghum varieties, the gene SbMATE encodes a specialised organic acid transport protein, which stimulates the release of citric acid. They cloned the gene and found it was very active in aluminium-tolerant sorghum varieties. They also discovered that the activity of SbMATE increases the longer the plant is exposed to high levels of aluminium. The rice variety on the left (IR-74) has the the gene locus Pup1, conferring phosphorus-efficient longer roots, while that on the right does not. The other project, co-led by Matthias Wissuwa at Japan International Research Centre for Agricultural Sciences (JIRCAS) and Sigrid Heur at the International Rice Research Institute (IRRI) in The Philippines, was looking for genes that could improve rice yields in phosphorus-deficient soils. They had already identified a gene locus (a section of the genome containing a collection of genes) that produced a protein which allowed rice varieties with to grow successfully in low-phosphorous conditions. The locus was termed ‘phosphorus uptake 1’ or Pup1 for short. With GCP support, the team were able to make the breakthrough of discovering the protein kinase gene responsible, PSTOL1 (‘phosphorus starvation tolerance 1’), and understanding its mechanism. Screening for phosphorus-efficient rice, able to make the best of low levels of available phosphorus, on an International Rice Research Institute (IRRI) experimental plot in the Philippines. Some types of rice have visibly done much better than others. The purpose of cloning these genes was to create molecular markers to help breeders identify whether the genes were present in the varieties they were working with. As an analogy, think of ‘reading’ a plant’s genome as you would read a story: the story’s words are the plant’s genes, and a molecular marker works as a text highlighter. Different markers can highlight or tag different keywords in the story. Tagging the location of beneficial genes in the DNA of plant genomes allows scientists to see which of the plants or seeds they are interested in – perhaps only a few out of hundreds or thousands – contain these genes. This forms the basis of marker-assisted breeding, which can help plant breeders halve the time it takes them to breed new high-yielding varieties for acidic soil conditions. Leon says that GCP provided both projects with the opportunity to validate their discoveries and to use what they had found to develop new aluminium-tolerant sorghum varieties and phosphorus-efficient rice varieties for farmers. But it’s what happened next that made this GCP initiative unique. Sorghum, rice, maize and wheat are all part of the Poaceae (true grasses) family, evolving from a common grass ancestor 65 million years ago. Over this time, they have become very different from each other. However, at the genetic level they still have a lot in common. Over the last 20 years, genetic researchers all over the world have been mapping these cereals’ genomes. These maps are now being used by geneticists and plant breeders to identify similarities and differences between the genes of different cereal species. This process is termed ‘comparative genomics’ and was a fundamental research theme for GCP during its second phase (2008–2014). Rajeev oversaw GCP’s comparative genomics research projects on aluminium tolerance and phosphorus deficiency in sorghum, maize and rice, as part of his GCP role as Leader of the Comparative and Applied Genomics Research Theme. Working together through a number of comparative genomics projects, the researchers were highly successful in reaching this goal, discovering valuable sister genes and beginning to introduce them into new improved crop varieties for farmers. Researchers at Cornell and EMBRAPA had already been using similar comparative techniques to look for SbMATE in maize because of its close familial connection to sorghum. This research was overseen by Leon and another EMBRAPA researcher, Claudia Guimarães. “We used the knowledge that Jurandir and Leon’s SbMATE project produced to prove that we had a major aluminium-tolerance gene,” reflects Claudia. Maize trials in the field at EMBRAPA. The maize plants on the left are aluminium-tolerant while those on the right are not. ZmMATE1 has a similar genetic sequence to SbMATE and encodes a similar protein membrane transporter that releases citric acid from the roots. Just as in sorghum, citric acid binds to aluminium in the soil, making it difficult for it to enter plant roots. The team have also discovered related gene ZmMATE2, which also encodes a transporter protein, but appears to confer aluminium tolerance via a different mechanism, as yet unclear. Claudia has developed a number of molecular markers for ZmMATE, which have been successfully used by breeders at EMBRAPA as well as by African partners in Niger and Kenya, such as Samuel Gudu, to identify maize breeding lines that have the gene. Left to right (foreground): Leon Kochian, Jurandir Magalhães and Samuel Gudu examine crosses between Kenyan and Brazilian maize, at the Kenya Agricultural Research Institute (KARI), Kitale, in May 2010. Samuel says they have developed some local aluminium-tolerant varieties, which rank among the best for aluminium tolerance. Interestingly, these varieties seem to have a different aluminium-tolerance mechanism to the Brazilian varieties. To help in the process, Samuel and his team are developing single-cross hybrids with a combination of both the novel Kenyan sources of aluminium tolerance and ZmMATE from Brazil, which will be even more tolerant to acidic soils. Suradiyo, a farmer from Bojong Village near Yogyakarta, Indonesia, harvests rice. 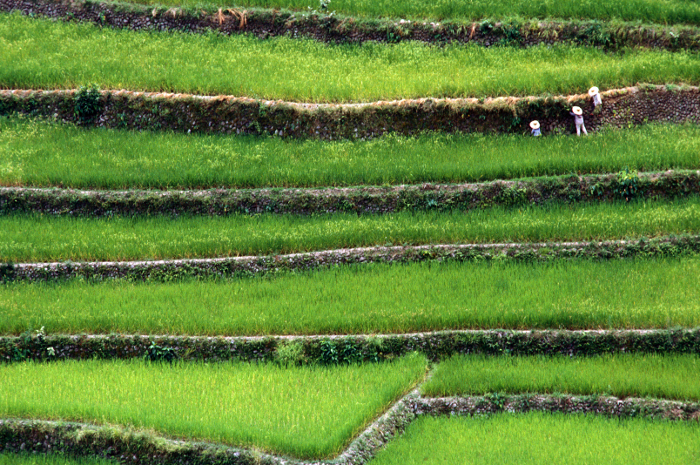 In Asia, about 60 percent of rainfed rice is grown on soils that are affected by multiple stresses. These typically include phosphorus deficiency as well as aluminium toxicity, salinity and drought. These stresses are particularly hard felt in Indonesia, which is the world’s third-largest rice producer. Joko Prasetiyono is a molecular rice breeder at the Indonesian Center for Agricultural Biotechnology and Genetic Resources Research and Development (ICABIOGRAD). His team have been collaborating with IRRI and JIRCAS for many years and contributed to validating the effect of Pup1 by embedding it into three popular local rice varieties – Dodokan, Situ Bagendit and Batur – which were then able to tolerate phosphorus-deficient conditions. 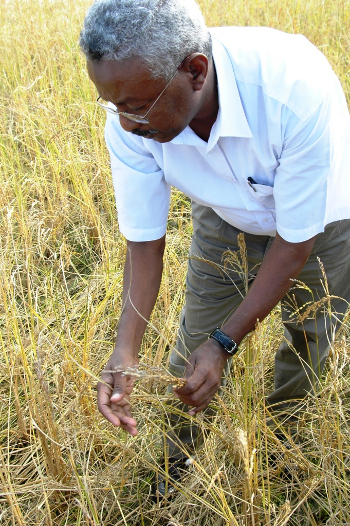 “The aim [with GCP research] was to breed varieties identical to those that farmers already know and trust, except that they have PSTOL1 and an improved ability to take up soil phosphorus,” says Joko. Joko says that these varieties – which will be available in one to two years – will yield as well as, if not better than, traditional varieties, and will need 30–50 percent less fertiliser. At EMBRAPA, Claudia is also interested in building up tolerance to multiple stresses and was involved in the project to look for genes similar to PSTOL1 in maize. “As soon as IRRI and JIRCAS had cloned the gene and created markers, we started using the markers to search for the gene in maize, as Jurandir did in sorghum,” she says. Women farmers in India bring home their sorghum harvest. Observing root architecture is difficult in ordinary soil, so the team had to develop new ways to visualise the plants’ roots. They grew plants in a transparent nutrient gel, which they then photographed to create three-dimensional images of the root structure. The team found sorghum and maize varieties that contained genes similar to PSTOL1 in rice, but which also have longer root systems that radiated outwards rather than downwards in gels with higher concentration of aluminium. “These observations helped validate multiple PSTOL1 regions in sorghum and maize, which we’ve been able to develop markers for to help breeders identify these traits more easily,” says Leon. These markers have successfully been used by sorghum breeders in Brazil and Africa to identify phosphorus-efficient varieties. Maize breeders in both Brazil and Africa are expected to use similar markers to validate their varieties in 2015. Eva Weltzien is one Africa-based sorghum breeder who has benefited from these PSTOL1 and SbMATE markers. Based in Mali at ICRISAT, Eva and her team have been using the markers to select for aluminium-tolerant and phosphorus-efficient varieties and validating their performance in field trials across 29 environments in three countries in West Africa. In Mali, sorghum is an important staple crop. It is used to make tô (a thick porridge), couscous, and local beers. Part of its popularity is its adaptability to various climates – in Mali it is grown in very dry environments as well as in forest/rainforest zones. However, it is widely affected by acidic soils. Sorghum farmers at work in the field in Mali. “We’ve had good results in terms of field trials. We have at least 20 lines we are field testing at the moment, which we selected from 1,100 lines that we tested under high and low phosphorous conditions.” Eva says that some of these lines could be released as new varieties as early as next year. One surprising observation that has Leon intrigued is a local sorghum variety with a phosphorus-efficiency gene that is close to where the SbMATE gene resides in the sorghum genome. “This suggests that SbMATE, which aids with aluminium tolerance, may also improve phosphorus efficiency. This means we could use SbMATE markers to look for both phosphorus efficiency and aluminium tolerance,” he says. Leon and Jurandir will continue to validate this result post-GCP. GCP’s comparative genomics projects have laid a significant foundation for further research into and breeding for tolerance to multiple plant stresses. A Kenyan farmer in her maize field. Although not all projects produced new and improved varieties ready for release, they are well and truly in the pipeline. Each partner institute is committed to work together and source new funding to continue on their quest to produce further products. Although the sun is setting on GCP, work on comparative genomics projects is still in progress, with all parties still working towards delivering important new acid-beating varieties to farmers. A boy rides his bicycle next to a rice field in the Philippines. With acid soils affecting half the world’s current arable land, acid-beating crop varieties will help farmers feed their families – and the world – into the future.